In the Biblical parable, a sower drops seed on a path, on rocky ground, and among thorns, and because of it the seed is lost; but when seed falls on good earth, it grows, yielding thirty, sixty, and a hundredfold. In the parable of the Wicked Sower, the grain is symbolized by the "Word," just as it was in the Dogon religion. The parable concludes with, "Then Jesus said to them. `Don't you understand this parable? How then will you understand any parable? The farmer sows the Word.'" "The Word" in the Dogon religion represented human seed or DNA. I believe that the Wicked Sower is being associated with the Dogon Jackal and the stolen fire, which represents DNA in the Dogon religion. It is associated with the first failed experiment or "Word". In Day of the Fish I describe the ancient fire ceremonies that occurred across Europe as being associated with Dogon myths about the stolen fire. Once Christianity began to replace the European pagan religion, which I associate with the Dogon religion, an interesting aspect of the fire ceremonies was that the parable of the Wicked Sower was linked to them. The parable of the Wicked Sower is relevant to the Dogon religion, where grain was a symbol of human seed, DNA and "the Word. "Shannon Dorey, Day of the Fish pp.221- 223. The fire in the fire rituals probably represented the stolen fire, or DNA, as well as the regeneration process. "Most scholars think the parable of the sower was originally optimistic in outlook, in that despite failures eventually the `seed' would be successful, take root and produce a large `crop.'" The parable of the sower appears in Mark 4:4-14, Luke 8, Matthew 13 and Thomas 9.Shannon Dorey, Day of the Fish pp.221- 223. 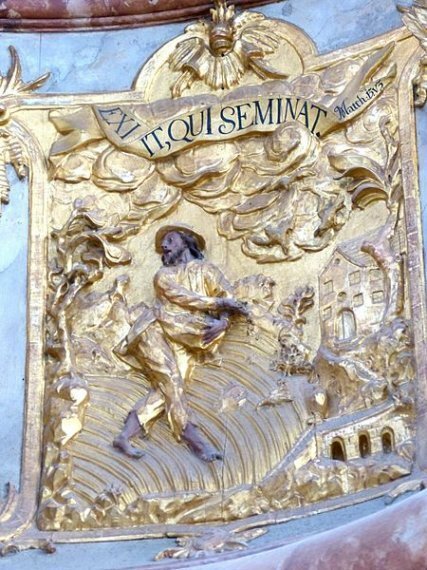 Besides being mentioned in reference to the ceremony at Eifel, in Germany, the parable of the Wicked Sower was also associated with a fire ceremony in Brabant in Belgium. Up until the early 19th century in Brabant on the same Sunday as the fire ceremony, women and men disguised in female attire used to go with burning torches to the fields, where they danced and sang comic songs for the purpose, of driving away "the Wicked Sower," who had been mentioned in the Gospel for the day. The men were disguised as women suggesting that this custom came from the earlier religion where the female was the good element, who was able to correct the wrongs created by the sower. It may also be a reference to the hermaphroditic Nummo Ancestors, who were identified with the divine feminine and who I associate with the Goddesses of Old Europe in Day of the Fish.Shannon Dorey, Day of the Fish pp.221- 223. The picture above is an interesting depiction of the Wicked Sower wearing a Joker's hat, which suggests an association with the trickster. This is important because in The Nummo, I associate the Dogon Jackal, who was responsible for stealing the Nummo's DNA or fire, with other trickster figures including Loki in Norse mythology, Reynard the Fox in British myth, and Prometheus in Greek mythology. Thieving is at the centre of many of these ancient myths. In Egypt, Thoth was the Greek god of thieves, Hermes. According to Graves, Thoth's symbol was a crane-like white ibis. In the Dogon religion, the Jackal was symbolized by the colour white. Thoth invented writing and also reformed the calendar. This association with writing is important because it associates Thoth with The Word in its written aspect, which symbolizes DNA in the Dogon religion. Shannon Dorey, The Nummo p. 78 and pp. 120-121. Since “The Word” is identified with the three Nummo experiments, it would make sense that myths about various world alphabets would be associated with the Dogon religion. If we equate "The Word" with genomes, and "letters" with DNA, we can see how significant Hermes and Thoth were to the alphabet. Graves reports that Hyginus said that the original thirteen consonant alphabet was taken into Egypt by Hermes (also the Roman Mercury). Shannon Dorey, The Nummo p. 84. According to Graves, the first written alphabet developed in Egypt during the eighteenth century BCE under Cretan influence and that there was a religious secret associated with the alphabet. The Dogon lived in an oral culture but they associated various trees with the various experiments. The letters of the ancient Irish alphabet, like that used by the Gallic Druids, were also named after trees. In The White Goddess, Robert Graves reveals that the Welsh Song of Taliesin was in fact a series of riddles, and the answers to the riddles were the letters of one of the alphabets. Graves writes that the Battle of the Trees (Câd Goddeu), which was also found in the same early medieval Welsh poem, the Red Book of Hergest, was a battle between alphabets and hence a battle of knowledge systems, which he believed took place when patriarchy overthrew Goddess-worship in ancient Britain. Graves found evidence that "one ancient Bardic alphabet had been replaced by a newer one of different structure. "Shannon Dorey, The Nummo p. 83. Eight trees were also referenced in an North American Indigenous story about the two brothers who changed things, and was told by Indigenous people living in Washington State in the US, and on Vancouver Island in British Columbia, Canada. I believe the story came from the Nuu-chah-nulth people who lived in those areas. In the story about the two brothers, there were references to the yew, arrow wood, cedar, spruce, hemlock, crab apple tree, cherry tree and alder tree.http://www.ilhawaii.net/~stony/lore43.html The DNA of the Eight Ancestors was considered the DNA of the Earth and these Eight trees likely symbolized the Eight Ancestors. I associate the two brothers with the First and Second Ancestors in the Dogon religion. You can read more about them in this article on North American Indigenous Myths and the Nummo Ancestors..
A black bird, resembling a bustard and a wader bird with a short neck, was known as Ogoyeru in the Dogon religion. According to the Dogon, the bird was beautiful and rare and its appearance prevented wars. It was known as the bird of the Hogon. I believe it was associated with the Mistress of Speech and the Nummo. In summoning the bird, the Dogon would say, "Help us so that Amma will make our speech all right. "Marcel Griaule, Masques Dogons p. 491. Amma was associated with the immortal DNA and the initial creation before the failed experiment. In other words, the Dogon were saying, please help make our DNA right again. 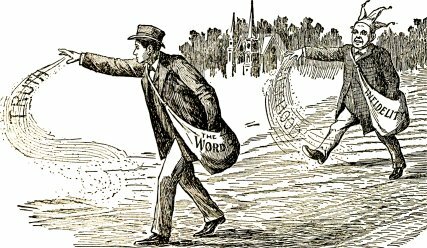 Another interesting aspect of the picture of the Wicked Sower with the joker's hat is that it comes from a 1902 book entitled, "Blasts from The Ram's Horn." I found the title of the book particularly interesting since the Nummo were symbolized by a ram and I refer to the Ram's Horn in The Master (Mistress) of Speech. This is another wonderful depiction of the Wicked Sower on Rococo pulpit from Mary Assumption parish church. It was created in 1748 by Joseph Deutschmann. In this picture, the fields are ingeniously displayed as a rainbow. This depiction indicates that the stolen seed is associated with the Sun. In the Dogon religion, the Nummos' stolen DNA was the stolen fire. The Sun was a symbol of the Nummo and when we get into Dogon astro-symbolism, which is described in The Rose, we realize that the stolen fire or seed is a piece stolen from a nebula and is associated with our lost Sun. The Dogon religion tells us that every piece of a nebula goes on to form some part of the Universe and when you perform an experiment and remove a piece from a nebula, bad things happen. Themes associated with the pagan religion were hidden in carvings in many church's under the nose of the Inquisition and are referred to in my books. I believe that this is one such example. For other connections between North American Indigenous cultures and the Celtic people of the United Kingdom read Chalk Mounds in England and Ohio Share a Common Source in the Dogon Religion and North American Indigenous Myths and the Nummo Ancestors..